What does the Nature Conservancy of Canada (NCC) mean to our donors? Three of them generously took the time to let us know. On July 5, new recreational facilities were inaugurated on four of our protected islands in the St. Lawrence River. 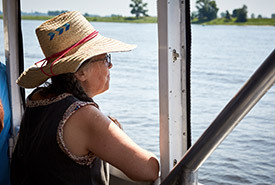 Many donors joined us on a boat tour to experience and enjoy the richness of the ecosystems of Île Bonfoin, Île à l'Aigle, Île aux Cerfeuils and Île Beauregard, located near the eastern tip of the Island of Montreal and near the cities of Repentigny and Verchères. We took the opportunity to chat and ask what NCC meant to them. Here are the answers from three of our dedicated contributors: Alison Hackney, Peter Solonysznyj and Shirley Gavlas.